Yesterday, UNESCO put washoku or traditional Japanese cuisine on ther list of Intangible Cultural Heritage Of Humanity. The details are here. It's only the second national cuisine to be put on this list, after French cuisine in 2010, but it's by no means the only food-related one to be there, not even the only one for 2013 (more on that later). This has been in the news in Japan for some time, and it is regarded as quite a big deal there. There has been a lot of concern amongst some purists that washoku is slowly being eclipsed by the popularity of food imported from elsewhere, especially the west. And, I have to say this about my countrymen: Japanese people just love it when they as a collective or a Japanese person gets official recognition overseas. To be a bit sarcastic, it's like one has not really and truly 'made it' until they get some kind of award from a non-Japanese entity. It's a bit weird. In any case, as someone who is deeply interested in the history and sociology of food, I think that recognizing food as a crucial part of our heritage is a great idea. Food is as noble a cultural heritage as dance or art or crafts, is it not? And I don't understand the snark and negativity that I have seen around it either, both about the designation of French cuisine when it happened and Japanese cuisine now. Food gets little respect amongst some people, I tell you. However, I'm not too sure what that Intangible Cultural Heritage designation does. Does it help to boost tourism? I don't know, and haven't really been able to find out, if it did anything for French cuisine in any way. Don't people travel to France for the cuisine anyway, and to Japan too? It is a hook to hang some promotions on. Or, maybe it's most important in raising awareness of the value of the cuisine within the country itself. In Japan as in many other developed nations, many people are increasingly going for convenient pre-processed foods and taking shortcuts. At the same time there's also an interest in going back to natural ingredients and traditional ways of doing things anyway. Perhaps this UNESCO recognition will boost such efforts. The importance of intangible cultural heritage is not the cultural manifestation itself but rather the wealth of knowledge and skills that is transmitted through it from one generation to the next. The social and economic value of this transmission of knowledge is relevant for minority groups and for mainstream social groups within a State, and is as important for developing States as for developed ones. If you want to learn some of the basics of washoku and you missed my Japanese Cooking 101: The Fundamentals of Washoku a few months ago, just start here and follow the links at the bottom. Submitted by maki on 2013-12-05 13:14. Having recently moved to Japan with many food allergies on board I am grateful for and cook washoku style dishes most days! There are very few processed ingedients I can eat but with the soy and wheat-free soy sauce and miso that is available, the abundance of fresh vegetables and meats and websites and books with recipes translated to English, I can enjoy a variety of healthy, tasty meals despite so many dietary restrictions! I find most dishes to be simple, easy and quick to prepare so that the time spent in the kitchen is not a burden. My Japanese husband and I laugh because I eat washoku much more often than he does! Wow, this is awesome. I've really gotten into cooking Japanese in the last couple of years. What an honor!! My guess, as a Frenchman, about the negaitvity is that the media and politics made a great deal of the unesco recognition of the "French gastronomic meal". Then people read what it was all about and realized it was not so much the recognition of French food as the recognition of how the family gathers around a table and how the meal is structured. In some Japanese cookbook of mine, it is suggested that the character of Washoku is directly related to the relative scarcity of ingredients in Japan. Much of the land in Japan can't be farmed, therefore there is a heavy reliance on seafood of course, and vegetables that can grow in poorer soils. I've always wondered at some Japanese vegetables that I don't see being flavorful, but I guess are native and traditional in Japanese cuisine. Kampyo (dried gourd) and Gobo (Burdock root) are two that come to mind. Neither has much flavor (in my opinion), but are essential in Japanese dishes. Here in California, there's lots of "western-ized" asian restaurants, according to friends of mine from Asia. But sometimes I wonder that some of the "western-ization" is because different (and possibly better) ingredients are available here compared to the place of origin. That said, I definitely prefer Washoku that I have in Japan compared to most Japanese food I've had here in California. Chinese food I have to admit I like a bit western-ized. It is "a matter of taste" perhaps. I happen to find the native Japanese vegetables, like gobo, tasty. Sometimes it is the texture as much as the flavor that I enjoy-like renkon(lotus root). Having recently moved from the USA to Japan I found flavor of vegetables and fruits here to be much more flavorful. Even basic, simple vegetables that are common in both countries have heightened flavor here in Japan. My guess would be that at least part of that is due to less travel time, things harvested closer to ripeness and sold sooner harvest. I have visited and lived here previously and didn't notice it as much but I eat such pure foods now that the natural flavors of the ingredients are more noticeable. I told friends that the oranges tasted more orangey than any I'd had in the USA and the onions are sweeter etc. I lived in Socal many years ;)I would say the ingredients available in the USA are different, not necessarily better ;)Certainly there are many westernized foods in the Japanese diet here in Japan, which is part of why it is important to preserve the traditional cuisine and methods of making it from natural ingredients. The snarkiness that is expressed about fine eating in the USA is reflected in the general attitude about food here. I am studying culinary arts - not to become a cook but to become a chef. I take pride in my toque and my uniform but I notice that when I stop to shop on my way home from school (I am over 60 and have a PhD in education) people react to me in a very strange way. Americans now view food as an extension of Big Food with fine eating reserved for a small elite that can afford it. This is not true in France - nor in Japan. Eating belongs to the art of living. I volunteer as an ombudsman for the elderly (and this is why I am studying culinary arts). I believe that our elderly are getting nutritious but boring food. Many of them don't eat enough and they waste away and die younger than necessary. I want to improve the general idea of good food as an essential part of health - as do the Japanese (and the French). I am now studying French cuisine but I want to study Japanese cuisine as well. Then I want to create guidelines for preparing tasty, attractive (nutritious) meals for the elderly. What an inspiring post, thank you for sharing. On our first trip to Japan, as members of a conference, we were lucky to have been served a wide array of Japanese cuisine. Everything was delicious and beautifully presented. On a later trip, on our own, we found everything we ate prepared with care and very tasty- from simple noodle bowls to bento lunches. Back at home in California, we enjoy our local Japanese restaurants, but wish they served a wider selection of tastes. For that we have to travel to San Francisco! Elizabeth Andoh must be very happy at this news. 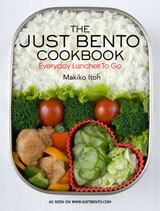 She has written at least 2 books on Washoku with excellent recipes, background info and pictures. She has lived in Japan for 35 years, gives lectures about the culture and cuisine all over the world and runs a culinary arts center in Tokyo. And Maki, you have no doubt contributed to the awareness of washoku outside of Japan that prompted UNESCO to recognize it.